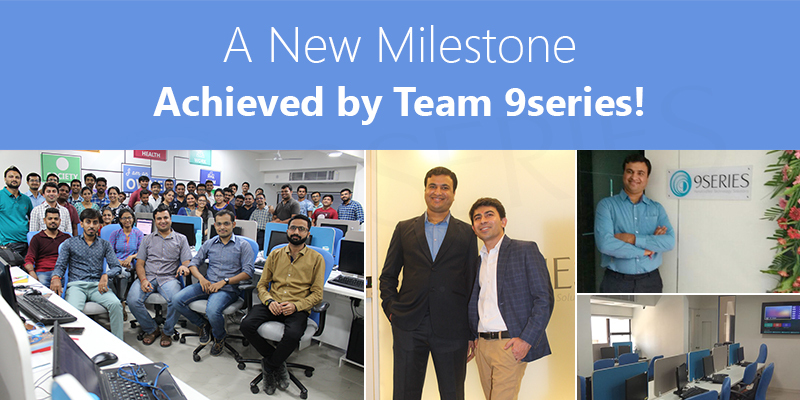 A New Milestone Achieved by Team 9series! Time has flown and we barely know how it went by, working on technologies and making new gigs in this competitive market. The entire team at 9series always had a dream to have a permanent base to call their den. Profound experience & expertise of the team and the trust of our clients in us helped us to achieve this milestone in a very short span of time. 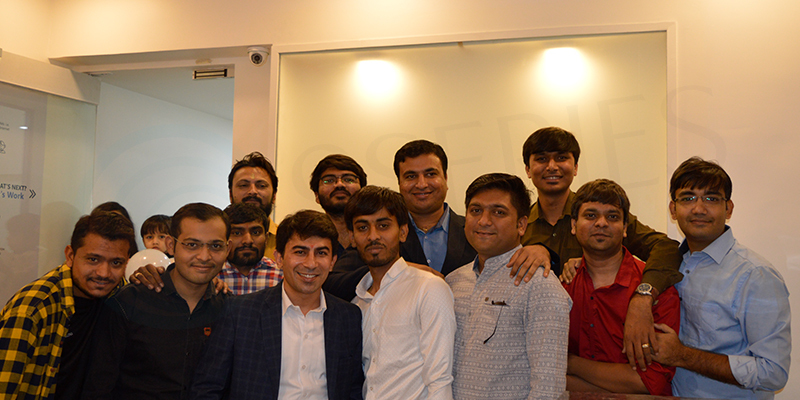 Being an established brand in the market and gaining the trust of clients across the globe, we decided to expand our development house in Ahmedabad, India. 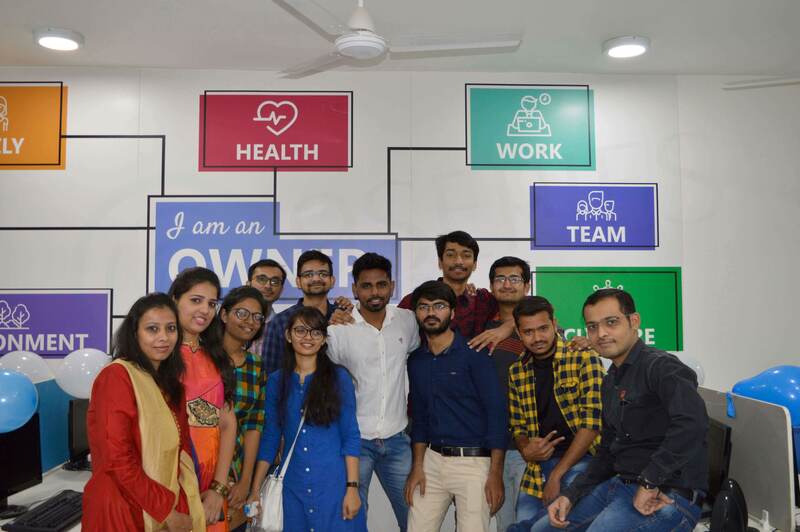 It takes great pleasure and pride to announce that we are now finally in our new office that is located in one of the prime and posh areas of Ahmedabad. When we talk about our 9series team, they excel in engineering, technology, testing, business development, and marketing. They work on each project with amazing positive energy. They showed the same excitement and zeal when we had to move to the new office. They put their entire energy to decorate the office and made sure it looked at its best for the Big Day. They insisted that they can decorate the office best, as they believe that office is their second home where they spend a lot of time apart from home. So, obviously, they had to give a little more to make the 2nd home look beautiful, elegant and fully equipped for the guests. 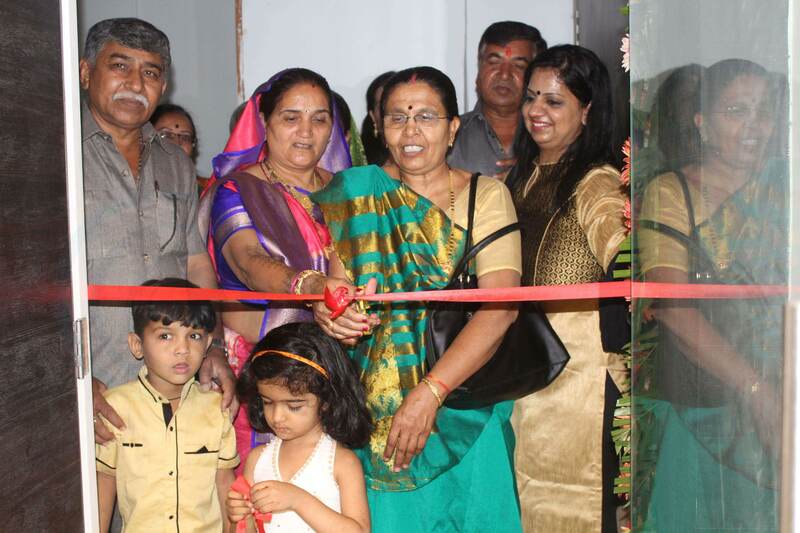 Normally, we have observed that ribbon cutting is done by famous personalities (Politician, Businessman, Actor or saints), But, our directors - Mr. Rajnikant Joshi, Mr. Dharmesh Rupadiya and Mr. Ashwin Vairu believe that all the source of positive energy comes from their parents. They know that they played and are playing a major role in their lives. A day to be marked in the history of 9series, 1st April 2018, the office was inaugurated by their mothers, they were very happy to inaugurate the office and their faces showed how proud they were to do the same. Sometimes you don’t need words to say anything your expression speak it all. And we all could see the pride and warmth they had for their sons and the achievements they made in their life. The event was filled with love and showered with blessing from friends, family and colleagues. There was constant flow of guest from 9am to 1pm. And our directors welcomed each of them with a broad smile and open arms. Every employee’s family was invited because they feel that they all are part of the success. Trust and partnership with the client working as a single team to solve the business problems motivated us in many ways. They shared their happiness and warm wishes from the distant corner of the world. Few of them took out time and remained present in the opening ceremony with all their support and warm wishes. It meant a lot to us, we were overwhelmed with their gesture. The colors used are blue, grey and white. Each color has its own significance and creates a positive environment. Blue is the color of sky and sea, it is associated with depth and stability. It symbolizes trust, loyalty, and wisdom, whereas white is the color of goodness, brightness, purity, and perfection. 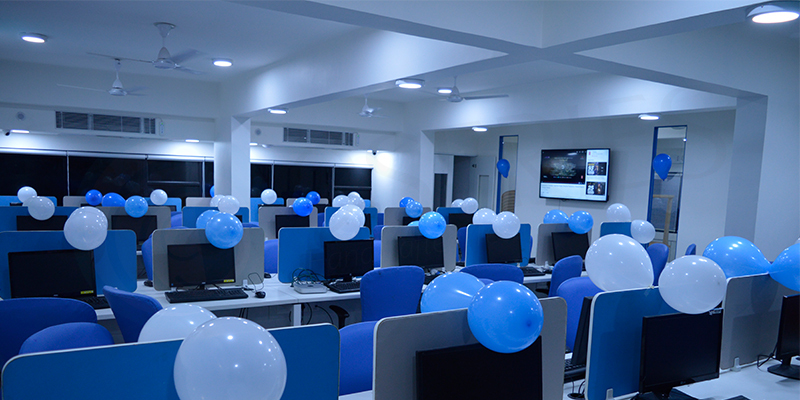 Space is utilized wisely that covers conference rooms, server room and seating arrangement with adequate space. 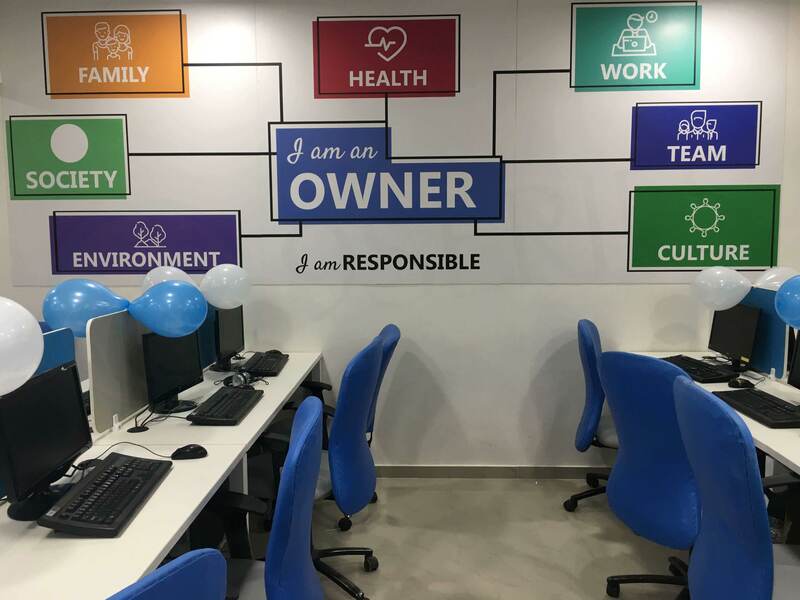 The message wall has a profound message that reminds every person in the office that they are the owner of what they do and they are responsible not only for the work but for the Society, Family, Team, Culture, and Environment. However, most important aspect is Health, physically & emotionally, this enables individuals to reach out to various goals. Our directors believe that business is one aspect, but we all have to play our role to make a difference in all the above aspects. 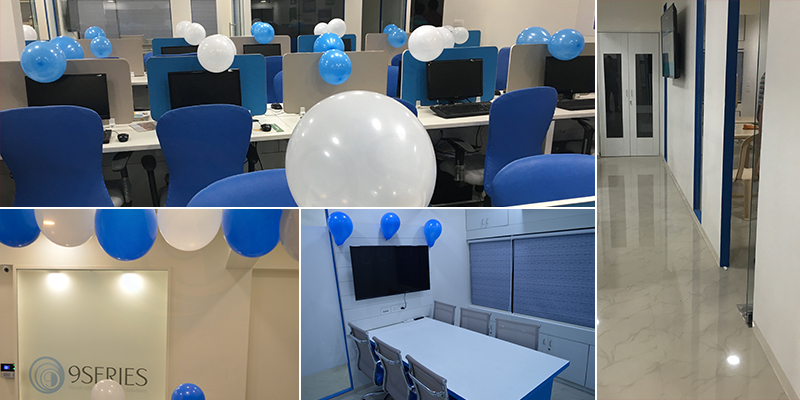 Hard and smart work of the team has finally been paid with the inauguration of the first office of 9series Solutions Pvt. Ltd.
Feel free to have a cup of coffee and discuss technology & business at our new office.